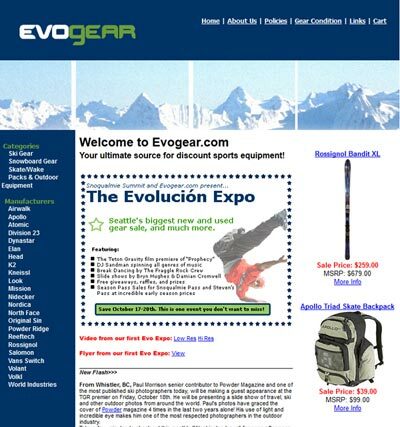 evo just turned 10, but in many ways, evo really started long before we bought gear through computers, skied on fat skis, rode on rockered snowboards and before both sports were allowed in the terrain park. My uncle Jack introduced me to skiing on Mt. Ashland at the age of 12 and I was immediately hooked. Not only was I hooked, I learned early on that if I was going to get on the hill more than once a year, I'd have to figure out how to pay for it. I started selling gear, clothes, baseball cards, car stereos and anything else that I could buy low and sell high in order to support my young addiction. As you can see, at best it was a modest attempt at selling used skis and snowboards. Two of us spent day and night in my 700 square foot Seattle apartment banging away on the computer and shipping skis and snowboards out of my garage. We'd try to clear out the last of our inventory before the snow actually fell, but when we'd work in the winter, it would be from internet cafes in Chamonix, before deep days in Whistler, or during late nights after an Alpental session. The thing about 2001 that makes it special isn't that we launched the first web site or registered the "evolución Innovations" LLC. Gear was being bought and sold for many years prior. What made it special is that it marked the time when "evo" as we know it today really came to life. It came to life through the early sale events where we'd highlight artists, photographers and movie makers while capping it off with great music and a dance party. It came to life as we started building a team of passionate, dedicated people that shared common values and interests. And finally, it came to life as we narrowed in on the vision to create a different retail experience that revolved around our customer who was not only a "skier" or a "snowboarder" but also someone immersed in the lifestyle and who was looking for more than a simple transaction. In the last 10 years we've logged thousands of powder and hardpack days both in the backcountry and the resort. We served hundreds of thousands of customers. We've thrown countless gallery events, movie premiers, music shows and benefits for non-profits doing important work in the community. We've grown from one to over one hundred employees. Along the way we have had huge successes and experienced unimaginable losses, many times stumbling our way through the minefield of growing a business. While I think that it's safe to say that for all of those who have been part of evo the last 10 years it has been a life-changing roller coaster ride, it's hard to imagine what the next 10 years has in store. I can say for certain that we will log thousands more epic days whether they are on the hill, in the water, in a foreign land, or right down the street at Crystal Mountain. We will open flagship spaces across the nation meant to embrace the local community and act as a catalyst to bring people together. We will hire hundreds more and work to create healthy, happy, fulfilling futures for them and their families. We will leverage our success and voice to give back and help kids that do not have the opportunities that others do. And last, not least, we will serve millions of customers and build one of the strongest businesses driven by a passion to "succeed" in all meanings of the word. 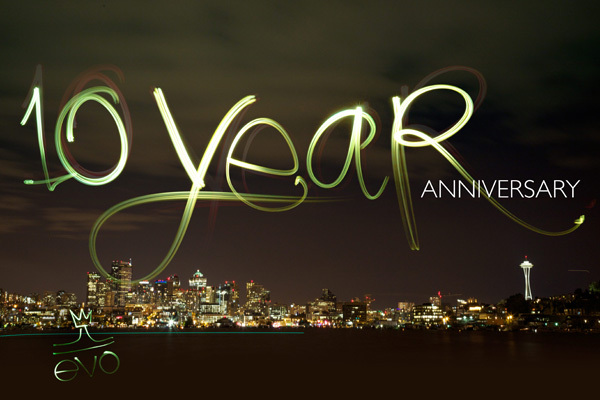 We thank all of you for your support over the last ten years and thank you in advance for the support in the years to come. It has been an amazing ride and we can't wait for what's ahead. The future is bright.